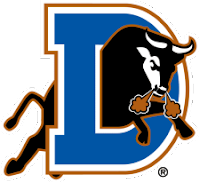 The Durham Bulls saw their winning streak come to an end on Monday night, but not before tying a franchise high eleven wins in a row. The Bulls are now 69-43 on the year and have a 13 game lead in the division. It was a big week for the Bull’s leaders Jeremy Hellickson and Dan Johnson, who both answered the call from the big club. Hellickson made his MLB debut Monday night against the Twins. He was then sent back to Durham and Johnson was called to take his place and has been there since while Carlos Pena is on the DL. Transactions: Jeremy Hellickson promoted to Tampa Bay (8/2/10). Dan Johnson promoted to Tampa Bay (8/3/10). Jeremy Hellickson added to roster from Tampa Bay (8/3/10). Leslie Anderson added to roster from Montgomery (8/5/10). Dale Thayer promoted to Tampa Bay (8/6/10). Jake McGee added to roster from Montgomery (8/6/10). The Week Ahead: 8/7/10-8/8/10: vs Indianapolis Indians (58-56). 8/10/10-8/12/10: vs Charlotte Knights (57-57). 8/13/10: at Gwinnett Braves (54-58).